At last, a reading update again. Without our typical school-year routines in place, I haven’t really been keeping track of the kids’ reading very well. The boys have been rereading a lot of Childcraft and My Book House books, and they’ve been checking out stacks of Hank the Cowdog from the library. We had an incident with two lost library books and some overdue fees, so book-borrowing is currently severely limited. 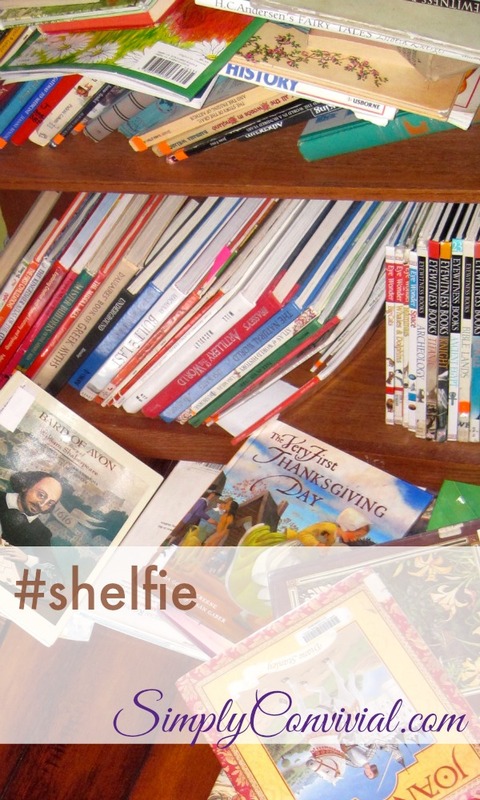 I’ve checked out a few things to investigate for the next school year and so the boys have been reading and rereading Twelfth Night by Bruce Coville, Tales from Shakespeare by Tina Packer, and Poetry for Young People: William Shakespeare. I like all three, too. Ilse and Knox are budding readers and did each check out two early readers from the library. I returned them quickly and didn’t write them down because they were just silly twaddle. Why are good early readers so difficult to find? Why is it expected that kids aren’t going to like books unless said books are about tv characters or gross topics? In the car on the way camping we listened to a Hank the Cowdog book and started Little House in the Big Woods. My husband likes Hank, too, and came away with a new favorite phase: “roasted on the grill of fate.” I finally sat down and set up and synced our various iPods (non-app iPods) so that the kids could use them for audiobooks. Now I just need to figure out a way to regularly charge them. We’ve been more consistent with quiet time these last couple weeks and an audiobook is a reliable way to engage the younger ones and settle them down quietly. I feel like I need to settle in to some audio books, too, for my listening. I’ve been on a podcast binge and really should move to something more sustained and less shallow (not all podcasts are shallow of course, but many of the ones I’ve been listening to are!). I am a bit of the way into Nicolas Nickleby, which I got for free on Audible last year. Audio is my favorite way to read Dickens. Then when I feel up to it, I also started An Introduction to Philosophy by , but I haven’t been feeling up to it lately. In my own reading life, I’ve finished a few. I really enjoyed Something Other Than God by Jennifer Fulwiler, and it provided meat for many conversations, which was all to the good. It was interesting to draw parallels and differences between it and Rosaria Butterfield’s Secret Thoughts of an Unlikely Convert, the most notable parallel being that the lynchpin was obedience and submission to truth and not understanding. They both came to a point of saying, “Whatever You say, God; I’ll trust You on this, even though I don’t get it.” and then that act of faith opened the floodgate of faith and understanding. Now I should read Surprised By Oxford while I’m in the genre of conversion stories. In the fiction department, I finished The Ocean at the End of the Lane by Neil Gaiman. It was weird, but fascinating, and a quick read. I think Gaiman is able to capture the feel that the old, original fairy tales might have had in their time. That is to say, they are creepy, but comforting in an odd sort of way, too. I mean, the guy quotes C.S. Lewis and G.K. Chesterton in the preface to all his books I’ve read, so he’s got to be ok, right? Still, this is an adult’s story and not a kids’ story. Even for Gaiman, it’s creepy, and it would probably not make sense in many places to a child. I have been doing something different for me: reading many books at the same time. I thought I would get a headache and confusion from reading like this but I am enjoying the variety. I, too, am reading The Disappearing Spoon, Gifts from the Sea by Ann Morrow Lindbergh, Attributes of God by Arthur Pinker, Beowulf trans. by J.R.R.Tolkien, Why I Read by Wendy Lesser and Ten Ways to Destroy the Imagination of Your Child by Anthony Esolen. I am enjoying my reading summer. That sounds great! I’ve been thinking about doing something similar. I loved Ten Ways! I read ‘Plenty for Everyone’ by Corrie Ten Boom myself, and have been overhearing Voyage of the Dawn Treader at bedtime (Nate and Toby). I love Hank the Cowdog and my mother in law tried to read it to the kids on a long drive…they listened but I think most of the humor was over their head. Soon, though! Oh, I’ll have to look into Plenty for Everyone!